Nightlife in Newport is as much a part of the culture here as the ocean, sailing and Newport's famous mansions. What you won't find in Newport is a large stadium venue, rather a healthy dose of small clubs and restaurants playing live music most days of the week. Even during the off-season, you'll find a good number of live music venues on Thursdays through Sundays. For complete listings of live music at any given time in Newport, we suggest going to the venue's website or picking up one of a few free local papers once you arrive in town. Expect to find rock, jazz, soul and acoustic guitar acts playing varied venues from pubs to 5-star hotels and restaurants throughout Newport. This popular nightlife destination features live music outdoors every afternoon and evening, dancing inside with a DJ each night. Classic Newport nightlife destination. 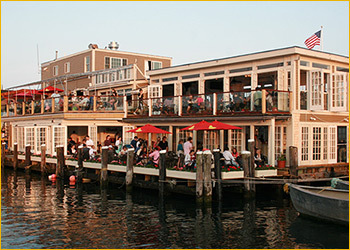 Best oceanview in Newport - pull up an adirondack chair on the lawn and watch the world go by late afternoon and early evening. This is the real deal- even the tables and chairs were imported from Ireland. Authentic pub atmosphere. Where a pint is a real pint of beer. This nightclub is busy year-round with live music most nights. Pool tables also available. Usually a college crowd. In the heart of downtown Newport, open after a recent renovation. Live music most nights of the week. Often a college crowd. Cover charge when bands are playing.